Firstly, it comes in nice high quality packaging. 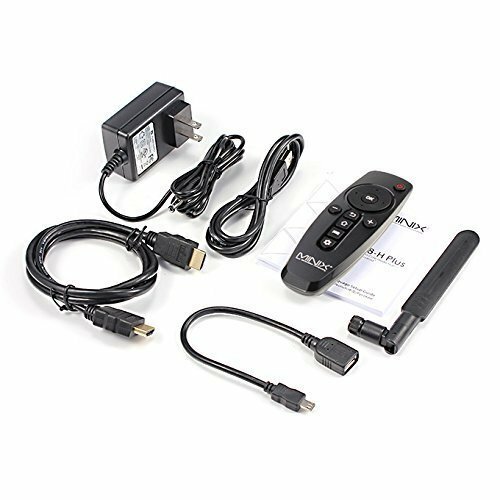 When you open the box you will find the NEO U1 in a plastic sleeve, a power adaptor, USB to Micro-USB cable, OTG cable, infra-red remote control, external antenna with an SMA connection, and an instruction manual. Taking a closer look at the box, on the front you will find the IR receiver and a very small dim blue light. On the left hand side you’ll find the external antenna. On the right you will find the power button, three USB 2.0 ports, one microSD card slot and one OTG port. At the rear of the device you will find a headphone jack, microphone jack, one HDMI out, one optical out, one Gigabit Ethernet connection and one power input. 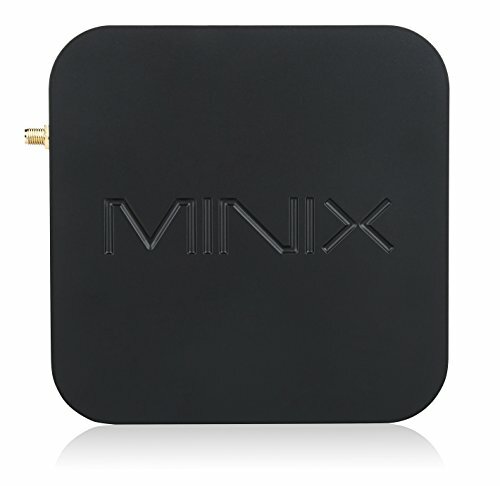 On the top we have that Minix logo, and on the bottom there is four rubber feet, and the whole box comes in a nice matt black finish. Regarding the remote control that comes included, it is an infra-red remote and we always recommend you replace it with a wireless one. Wireless remotes are cheap, and offer far superior features and performance over these standard infra-red remotes. 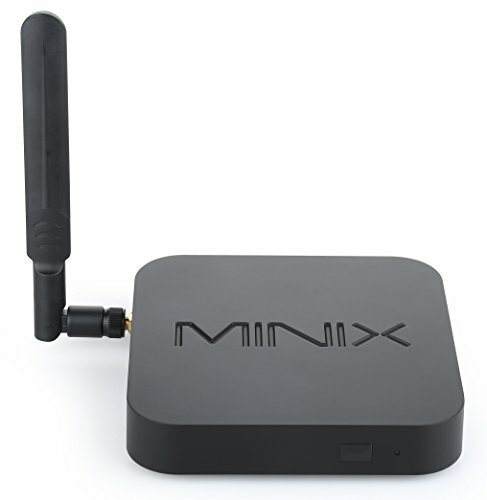 Minix have some really nice remotes that work really well with their boxes, and we would really recommend bundling one with this box at purchase. 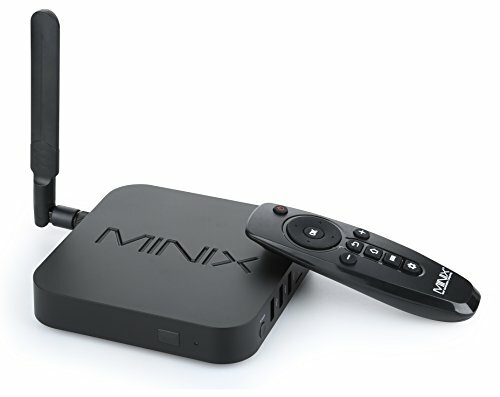 You can check out all the best remotes for android TV boxes here, including two Minix models, the Minix A2 and the Minix A2 Lite. You are presented with the Minix ‘Metro’ launcher, which is very user friendly, and allows you to display all your app etc. on screen in an easy to use format. At the top of the screen is the network interface icons; Wi-Fi, Ethernet, Bluetooth and VPN, which let you know at a glance what you are connected to, in case you forget! The large icons you can see in the image are TV friendly icons that are completely customizable, so you can bundle your favourite apps and shortcuts together. All in all it’s a nice, friendly interface. There is also the option of a clean, more minimalist version, and of course you can always install whatever launcher you like best. 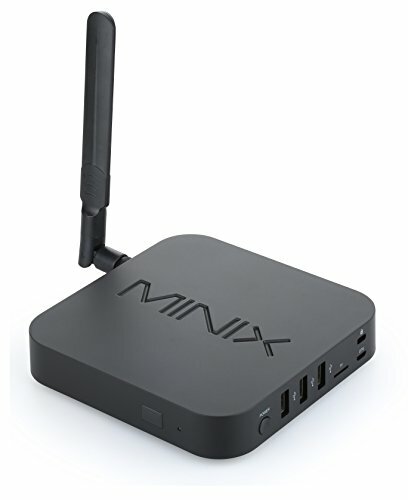 A nice feature that this Minix machine has over the cheaper boxes is the online update functionality, so as soon as you take it our t of the box you can update everything to the latest versions. Read/Write: 110MB/S on read, 77MB/S on write. Speedtest: So in our Wi-Fi speed test, the box clocked 72M/BS of download and 19MB/S of upload. When connected to the Ethernet, it clocked 100MB/s download and 19 MB/S upload, which is pretty much maxing out our connection. Geekbench: On Geekbench we got a Single-Core Score of 610 and a Multi-Core Score of 1743. On Android platform gaming, we testing some of the most demanding titles on the market and had no issues whatsoever. We were very happy with the performance. The U1 comes pre-installed with an optimized version of KODI that played everything we threw at it! Our tests included playback at 1080p and also some 4k video with H.264 and H265 codecs and the results were good. The 1080p was especially good, but the 4k video in KODI didn’t perform too well, and there was some artefacts and out of sync audio. However we suspected that this was down to the KODI software rather than the device, so we tested the same clips in MX player. This time the videos played back much, much better, with no real issues to report. The U1 is also capable of playing 10bit video files. Netflix user interface is nice, and designed for a big screen. Scrolling through categories is easy, especially with the wireless remote. 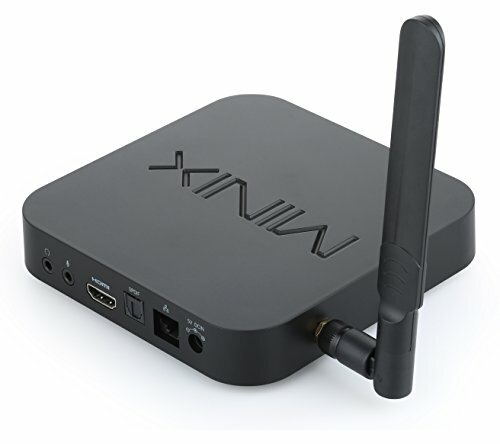 That’s it for Minix NEO U1 review, let us know what you think in the comments, or if you have your own review add it there. Overall a very good box, with a really good build quality. However maybe it doesn't justify the price tag, and you could be either better off spending half the amount on a budget box, or a bit more and getting a real premium device. The Launcher interface reminds me of the xbox one interface. The video playback is really what is important me the most about this device. Knowing that you are basically going to get mostly 1080p playback is a bummer if you have a 4k TV. If you only have a 1080p HD TV this system is perfect unless your trying to use KODI on your device. We all know KODI has some titles that say 1080p or HD near the title only to find out that the video is not in that format while watching.